l to r: Karen, Robin Kissee, Gary Dilley, Gary L.
The annual Blues and Arts Festival was held on March 18thand 19th at El Dorado Ranch. It was a beautiful day, with many headliner groups returning to thrill the crowd who had come from near and far to hear their favorite Blues groups. Thanks to Gary Dilley and theSan Felipe Lions Club, this years festival was well organized, including recruiting top name groups to the festival. Gary Dilley stated that they begin organizing the next year's festival the day after the current one ends. He also stated that all the money made is given to local charities (such as Sonshine Hacienda) except for an amount set aside for the next years festival. Sonshine Hacienda received $5,000 dollars from the 2016 Blues & Arts Festival! What a blessing. We thank all the hard working Lions Club members who are all so generous with their time and energy. Sonshine Hacienda is grateful to you for helping our children ! 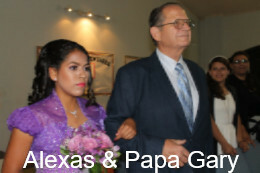 May 21st we stood speechless watching Alexandra walk the center aisle of our church arm-in-arm with Papa Gary. Her three sisters had preceded her. All four looked like precious angels. Alexa was in a purple, glass-beaded gown and her sisters wore matching tea length lilac dresses with glass beading. I could not help but think of the time when we first met these sisters. It was on May 10, 2006. The bell rang. Standing in our doorway were four young sisters brought to us by "DIF," our version of "CPS." Adriana, the youngest, was only 4 years old, and Alexa was the oldest. They were so scared. They had never been outside of the city of Mexicali and had no idea where they were. But as time passed, the girls began to feel at home at Sonshine Hacienda. Since that first day, they have become great help to their Dorm Mothers. They are great examples for the other girls. 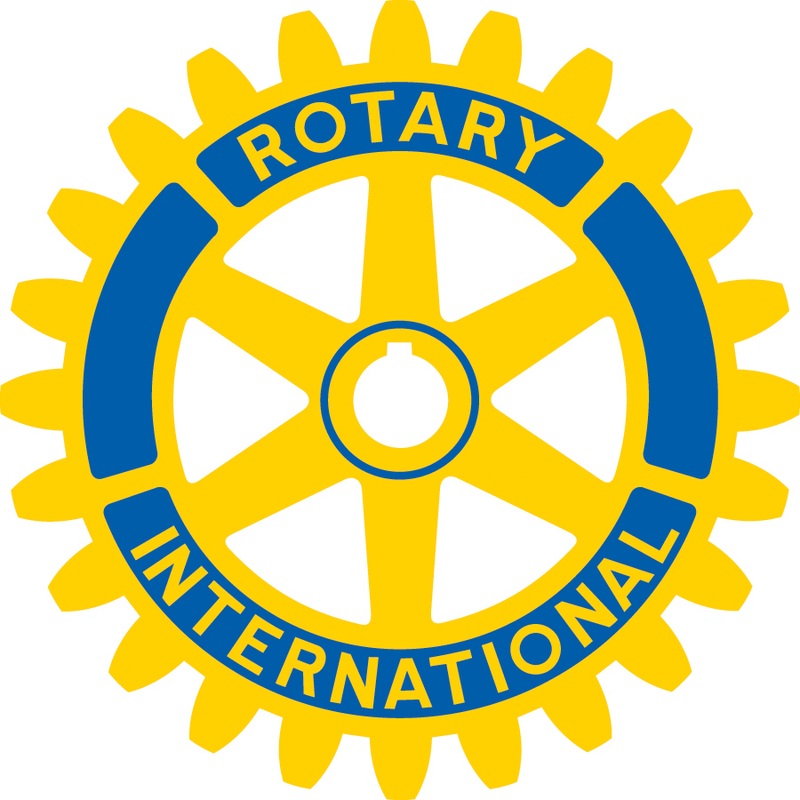 Rotary Club of San Felipe is very active in our community helping in many ways to make life a little better for its residents. 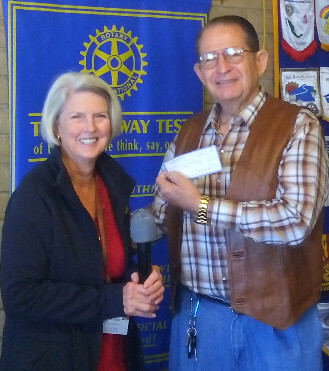 The San Felipe Rotary Club recently adopted Sonshine Hacienda as one of its project to help with sustaining monthly support. They kicked off this commitment with a generous check and are continuing to help our children monthly. The old saying that “It takes a village to raise a child” is so true. 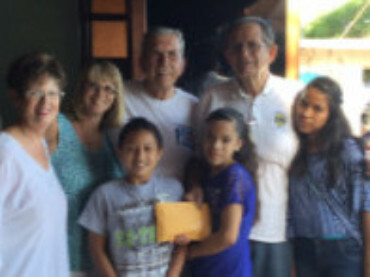 We could not continue to care for our children at Sonshine Hacienda if it were not for the generosity of the wonderful people of San Felipe and groups like San Felipe Rotary.We would like to thank all of the Rotary members in San Felipe and all of the members worldwide who do so much to help those in need. 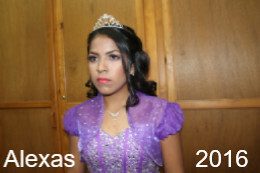 So when we met with Alexa, we discovered that she was very eager to have a Quincenera. So the planning began! And it really took a village to execute the plan. Let me just say here that we owe a big debt of gratitude to so many friends, church members, and people from the States who helped to complete the task. You all know who you are! Alexa, Gary & I, as well as Diana & Alvaro want to thank you for all you have done to make this night so special for Alexa. God Bless each of you for your help. In a nutshell, here's what happened. The evening began with a service at our church, which was decorated beautifully by anEvent Planner that we hired. Afterward, we went from the church building to a Salon which was decorated in pink and purple colors. We had a delicious dinner, and afterward we had a tieredcake to enjoy along with a lovely dessert table. We then danced, listened to a Christian band, and visited with one another. Alexa was presented with a photo album and other remembrances of her special night. If you come to Sonshine we are sure Alexa would love to show you her pictures and other memorabilia of her special evening. On behalf of Alexa, thank you so much for making a difference in her life. God Bless each of you.